This is a 15-minutes presentation about my PhD-work from Interaction'18 in Lyon in February 2018; The Creative Possibilities when Designing for Conversations. It was pretty scary to be presenting at the big stage with almost a 1000 people, just a short while after Alan Cooper… But afterwards it always feels good to have done it! I learned a lot and had interesting conversations after the talk, and I really like the crowd at the Interaction conferences. It has a great mix of researchers and practioners, women and men, people from every part of the world, young and old. At my first Interaction conference in Dublin in 2012 I met an interaction designer from Saudi Arabia. I enjoy these meetings across, and I find the atmosphere at Interaction to be genuinely curious, reflective and friendly. Read more information about the presentation at interaction18.ixda.org. Photos by Thibault Paccard and Alice Dardun. If you are curious about the framework presented in this talk, I am currently developing a guidelines & propositions-document, which is not really guidelines, but rather a ton of questions for the designers of such spaces, one page for each "ingredient" in the model. See pictures from the document below. I am interested in hearing if this could be useful/not useful for you, your team or your students – basically anybody developing concepts for conversational spaces online. My framework is particularly based on contexts such as online newspapers and magazines, where the conversational space is a part of the concept (and not the whole concept), but it seems as though the model might be useful for many types of conversational space concepts. Please contact me if you are interested in seeing the first draft version of the document. Cover page and model with "ingredients" or components wherein each of these has a large number of creative possibilities. 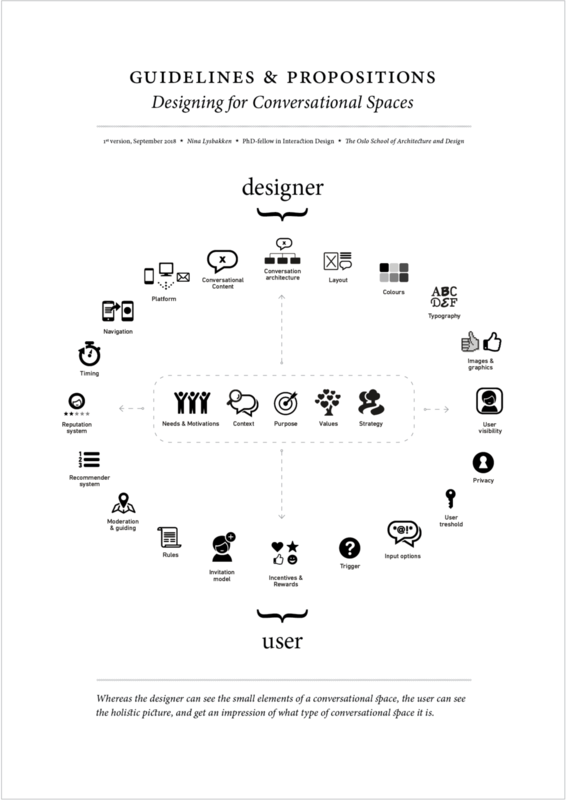 Knowledge about users needs and strategy (the ingredients in the middle) can influence the choices in the circle ingredients. This shows one page from the document, about what I defined as Input Options, one of the ingredients in the model. Each ingredient in the model has one page with questions for the designer. Another page with the ingredient I defined as Conversational Architecture. If you are a Norwegian designer who wants to present something you have learned abroad, you can get funding from Design and Architecture Norway + The Norwegian Ministry of Foreign Affairs. See stikk.no and the tweet below.